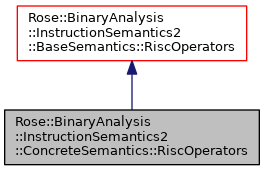 Defines RISC operators for the ConcreteSemantics domain. 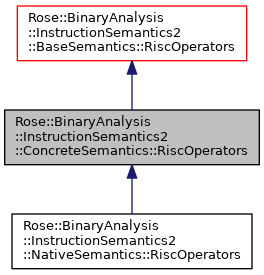 These RISC operators depend on functionality introduced into the SValue class hierarchy at the ConcreteSemantics::SValue level. Therefore, the prototypical value supplied to the constructor or present in the supplied state object must have a dynamic type which is a ConcreteSemantics::SValue (or subclass). Definition at line 332 of file ConcreteSemantics2.h. Instantiates a new RiscOperators object and configures it to use semantic values and states that are defaults for ConcreteSemantics. Definition at line 353 of file ConcreteSemantics2.h. References Rose::BinaryAnalysis::InstructionSemantics2::ConcreteSemantics::SValue::instance(), Rose::BinaryAnalysis::InstructionSemantics2::ConcreteSemantics::MemoryState::instance(), Rose::BinaryAnalysis::InstructionSemantics2::BaseSemantics::RegisterStateGeneric::instance(), and Rose::BinaryAnalysis::InstructionSemantics2::BaseSemantics::State::instance(). An SMT solver may be specified as the second argument because the base class expects one, but it is not used for concrete semantics. See solver for details. Definition at line 364 of file ConcreteSemantics2.h. Definition at line 370 of file ConcreteSemantics2.h. Definition at line 377 of file ConcreteSemantics2.h. Definition at line 382 of file ConcreteSemantics2.h. Run-time promotion of a base RiscOperators pointer to concrete operators. This is a checked conversion–it will fail if x does not point to a ConcreteSemantics::RiscOperators object. Definition at line 392 of file ConcreteSemantics2.h. The major and minor numbers are architecture specific. For instance, an x86 INT instruction uses major number zero and the minor number is the interrupt number (e.g., 0x80 for Linux system calls), while an x86 SYSENTER instruction uses major number one. The minr operand for INT3 is -3 to distinguish it from the one-argument "INT 3" instruction which has slightly different semantics.